Congratulations to our three winners – Mssrs. Belazi, Scherr and Oakley. Your copy of Daniel Rintz’s first film, Somewhere Else Tomorrow, is on the way thanks to the US Postal Service. We’ll have more drawings in the future, and the only way to win is to be on this mailing list, so encourage your friends to listen to the podcast and opt in to the mailing list. Send ’em the link: tinyletter.com/chasingthehorizon. You can still contribute to Daniel’s Indiegogo campaign to fund the postproduction work on his second, as yet unnamed, film. End of discussion of old business is motioned, seconded and passed by show of hands. Our new business is that the newest episode of Chasing the Horizon is out! Episode 7 features my discussion with Erik Stephens, who founded Twisted Throttle and is the company’s CEO. He left a promising career as an environmental engineer to follow his entrepreneurial dream, and I have to say as a customer of Twisted Throttle, it was a good choice. (Disclosure time? I have Barkbusters hand guards on my bike!) Erik talks about how he got started in motorcycling and how he got started with Twisted Throttle, as well as what’s in his company’s future. Episode 7 also features news about electric motorcycles and some of what people attending the massive trade show EICMA can expect to see on the floor from Honda, Yamaha, Ducati and others. (Thanks as always to Cycle News for helping us out!) I also get into one of the MOA’s more esoteric member benefits, a 40% discount offer from Men’s Wearhouse. Listen to the episode to see how that even came up. Two small housekeeping things: 1) I retitled all the episodes so they’re more descriptive in iTunes. Instead of all starting with “Chasing the Horizon,” they now start with the episode number and the name of the guest; and 2) I am going to continue to apologize for the high noise levels during many of the interviews. I did many of the interviews for the first season of the podcast during the MOA’s rally in Salt Lake City last summer, and we were in a building with little insulation and a noisy HVAC system. I’m doing my best to ameliorate the problem, but it’s difficult to eliminate all the noise with the tools I have at hand for podcast production. I appreciate your patience. Episode 8 will be out on 13 November, when you’ll be treated to the discussion I had with Polly Pierce. Polly served as a product tester for a women’s motorcycle apparel & accessory maker called MotoChic last summer, and sitting down with her treated me to a discussion filled with unbridled enthusiasm for riding and life. You can get to Chasing the Horizon via iTunes or the website (here, duh) – please share the links out via social media and email as much as you like. Feel free to follow us on Twitter (@horizonpodcast) and Facebook (@chasingthehorizonpodcast) as well. Upcoming guests on the podcast include Paul Guillien (Touratech USA), Harold Cecil (Giant Loop), Sam Manicom (Into Africa & other books), Randy Richardson (Michelin) and more. Speaking of more – I’d love to hear from you about who you’d like to see me sit down with to talk about motorcycles, motorcyclists and motorcycling. 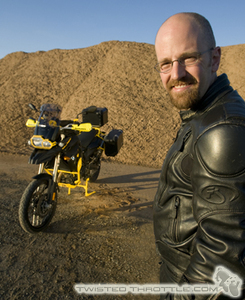 Drop me a line at podcast@bmwmoa.org to tell me all about it. 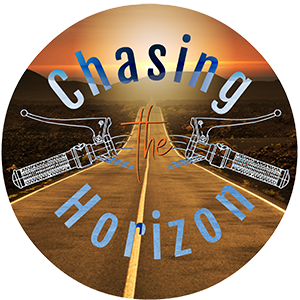 Thank you again for listening to Chasing the Horizon, a podcast by, for and about motorcyclists.